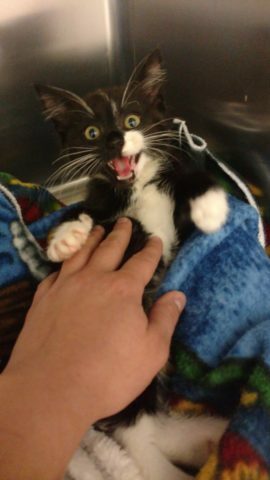 Someone threw a kitten at a school bus in Maine. A clinic is scrambling to save him. Hiccup, a kitten rescued after being thrown at a school bus from a moving car, has a new home. If cats have nine lives, a kitten definitely used one of his earlier this month in Winterport when he was saved after reportedly being thrown at a school bus from a moving car. 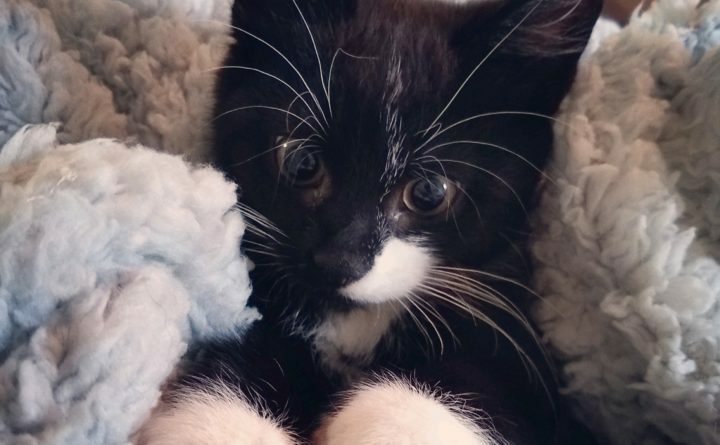 The kitten, dubbed “Hiccup” by the staff at Ridge Runner Veterinary Services in Winterport, was lobbed out of the car somewhere along Monroe Road on the morning of Wednesday, Oct. 3, according to Jen Marlow, a veterinary assistant at the clinic. The children riding on the bus were the ones who noticed the little black and white cat that came out the window of the car. Hiccup was rescued by a quick thinking school bus driver earlier this month in Winterport after someone threw the kitten out of a moving vehicle at the school bus. Neither Marlow nor Regional School Unit 22 officials were immediately able to identify the bus driver, although a school employee said that she likely works for John T. Cyr & Sons, the bus company that contracts with the school district. Efforts to speak with the driver or an official from the bus company were not immediately successful. As for the driver of the car, Marlow said she didn’t believe that anyone was able to get a description of the car or a license plate number. Chief Deputy Jason Trundy confirmed Tuesday afternoon that no one had reported the incident to the Waldo County Sheriff’s Office. According to Marlow, the bus driver brought the kitten to the bus depot, and then a coworker brought it to the Rachel and Shannan Grooming Salon on Main Street in Winterport, a business whose owners often help to rescue cats. After that, Hiccup made his way to the veterinary clinic, where it was immediately apparent he was in bad shape. An X-ray showed that the kitten, estimated to be roughly 9 weeks old, had another problem — a badly broken leg. At first, it seemed as if the leg couldn’t be saved, which is why staff named him “Hiccup,” after a character in the movie “How to Train Your Dragon” who had an amputated leg. But then a doctor at the Lucerne Veterinary Hospital in Dedham heard about the kitten and wanted to help. Hiccup had an evaluation at the hospital, but medical officials there decided that it would be better for the cat to try to keep him still and let the leg heal on its own. “Between the pros and the cons of surgery and the risk of anesthesia, they elected to let it heal,” Tanya Stiles, the hospital manager at the Lucerne Veterinary Hospital, said Wednesday. So far, Hiccup’s leg seems to be doing well, Marlow said. “As long as he remains immobile, it’s healing OK,” she said. Another positive change in Hiccup’s life is the fact that he has a brand-new family. Marlow sent her sister a video of the kitten purring and kneading his blanket, and she decided to take him in immediately. Employees at the veterinary clinic are used to having people just drop off unwanted animals there, perhaps in the mistaken belief that they can find homes for those animals. She is delighted that Hiccup has landed on his feet, all four of them. And she is grateful that an online fundraising campaign launched by the veterinary clinic to help defray the costs for Hiccup’s care and aftercare had raised more than $650 by late Tuesday afternoon. That, and the fact that so many people jumped in to help Hiccup, help a bit to make up for the actions of the person in the car, she said. Correction: An earlier version of this story incorrectly stated that Hiccup had been operated on at the Lucerne Veterinary Hospital.